Turn 4 at the Brickyard 400. One of NASCAR’s premier races, the Brickyard 400 takes place annually and is now the last race of the season in September at the Indianapolis Motor Speedway. A national network broadcast of the race is simulcast on 107.5 /1070 THE FAN. Locally produced Brickyard 400 Pre and Post Race Shows are filled with interviews with dignitaries, drivers and fans plus weather forecast updates and traffic reports. 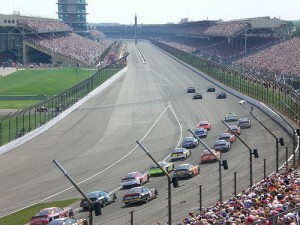 Qualifications for the Brickyard 400 takes place the day before the Race and is also covered by 107.5 / 1070 THE FAN.